Wheatgrass is a food prepared from the cotyledons of the common wheat plant, Triticum aestivum (subspecies of the family Poaceae). It is sold either as a juice or powder concentrate. 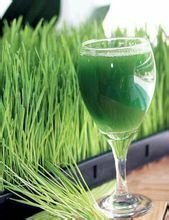 Wheatgrass differs from wheat malt in that it is served freeze-dried or fresh, while wheat malt is convectively dried. Wheatgrass is allowed to grow longer than malt. Besides of contain vegetable protein, natural vitamin, and kinds of minerals, the barley leaves also include diversified nutrient, for example, activated ferment, chlorophyll, animalistic flavone, and so on. The nutrient can meet body’s need and be absorbed fully. It’s the best natural health food.